Brussels has said it would be "extremely concerned" if the defence group EADS was prevented from fairly bidding for a major US defence deal. 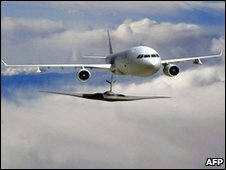 Its comments came after pan-European EADS and US partner Northrop Grumman abandoned a bid for a $35bn (£23bn) mid-air refuelling aircraft contract. Northrop Grumman and EADS said the terms of the Pentagon tender "clearly favour" US aerospace giant Boeing. Boeing is now widely expected to win the contract for the aircraft. The US Pentagon said the contract could even be awarded sooner than expected now that only one bidder remained. Companies were due to submit their bids by mid-May, but that could now be brought forward. The United States Air Force is seeking to replace its ageing fleet of 1950s-built KC-135 air tankers, which refuel other military planes in mid-air. There is nothing graceful about EADS and Northrop Grumman's withdrawal from the competition to deliver planes that refuel US fighter jets mid-air. Winning the contract would have bolstered the two stalking horses' coffers with much-needed cash. Instead, this saga may well have soured cross-Atlantic relations for years to come. The two clearly feel that favouritism by the Pentagon has dashed their hope of wrestling the US Air Force contract from Boeing and, in the process, unseating the giant from its top spot in US aerospace. Many European policy makers agree. Northrop and EADS planned to supply a tanker plane based on the large capacity A330 plane made by EADS subsidiary Airbus, while Boeing's tanker, the KC-767 is based on its smaller 767 plane. A variant of the Boeing tanker plane is already in use with the Japanese air force. Northrop said the US defence department's latest proposed air tanker requirements were unfairly geared towards a smaller aircraft such as the 767. The European Commission said in a statement that "it would be extremely concerned if it were to emerge that the terms of tender were such as to inhibit open competition for the contract". It added that it "will be following further developments in this case very closely". UK Business Secretary Lord Mandelson echoed the Commission's concerns. "I am extremely disappointed at this announcement," he said. "Given the open market to US producers we have in Europe, it is very disappointing that a US-led European consortium feels that the revised tanker procurement process is now so biased against them that it is not even worth making a bid. "It is doubly disappointing when you consider that two years ago EADS, with their American partner, were awarded the contract fair and square." Meanwhile, German Federal Minister of Economics and Technology, Rainer Bruederle, said he was "disappointed by the way the US defence ministry acted". He added that the rules had "clearly favoured" Boeing, when "open competition should not be decided unilaterally". The Pentagon said it regretted the EADS/Northrop Grumman decision, but US authorities have yet to respond to the European Commission's comments. Northrop and EADS had planned to assemble the tanker planes in Alabama, where 300 new jobs would have been created. Alabama Senator Richard Shelby said the competition had been wrongly "structured to produce the best outcome [for Boeing]". "The air force had a chance to deliver the most capable tanker possible to our war fighters and blew it," he added. EADS chief executive Louis Gallois told BBC World Service that it was widely recognised that its planned tanker plane was better than the Boeing rival. "For the Americans it is perhaps not extremely good, because the US taxpayer will not be the best beneficiary, and the US Air Force will not have the most capable airplanes," he told World Business News. The Pentagon said they were confident they would be able to negotiate a fair price for the tankers, even without a rival bidder in the frame. The US Air Force's efforts to replace its air refuelling tankers has had a protracted history. Boeing was initially awarded the contract in 2003, only for it to be subsequently cancelled after an ethics scandal that saw a US Air Force official convicted of criminal conspiracy. The official in question was said to have unfairly promoted the Boeing deal. Northrop Grumman and EADS then won a contract in February 2008, but this was subsequently cancelled following a Boeing appeal. At the time, there was substantial political opposition in Washington to the involvement of EADS, which owns Airbus, the European rival of US-based Boeing.